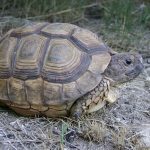 Tortoises are reptiles easily identifiable by their shell, which acts as their armor. 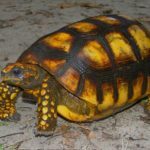 They are land-dwelling in contrast to the similar looking turtles. 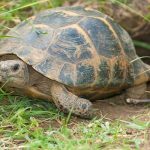 The shell covering the back of the tortoise is called the carapace while the one covering the belly is known as the plastron. 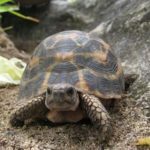 Tortoises are herbivorous animals. 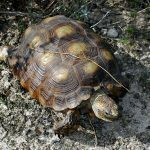 They feed on weeds, grasses, flowers, and fruits. 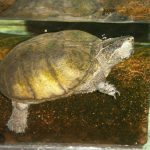 However, some members of the family are omnivores, and in addition to the plant materials, also feed on worms, insects, and carrion. 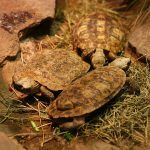 Tortoises lay eggs in a clutch numbering from 1 to 30. 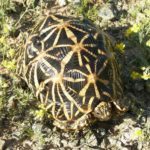 After laying the eggs, the female covers it up with sand and clay and leaves it to incubate by itself. 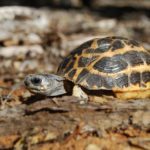 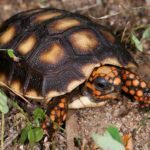 In order to hatch by themselves, the baby tortoises develop an egg tooth which they use to break out of their egg shell. 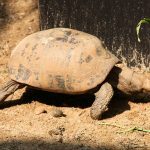 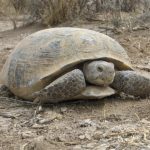 Tortoises are the longest living terrestrial animals, with an Aldabra giant tortoise at Kolkata Zoological Gardens, named Adwaita, believed to have lived for 255 years.